I've never cared much for the right or wrong side of history argument for three reasons: First, it assumes that to be on the right side of history necessitates power, and those with the most power get to determine the right side of history. It is an imperial and colonial reading of history. Second, everyone automatically assumes their views line up with the right side of history, which I think is rather intellectually arrogant. Third, every reading of history is interpreted. When someone states that a certain position is on the right side of history, they are offering their reading of history. History is always interpreted. When someone tells me "we need to be on the right side of history" I look quizzical and ask whose history? Which history are you talking about? Has anyone been reading literature these past forty years (the beginning of postmodernity)? There is no one interpretation of history. There are multiple histories. To claim one history is right over another is an imperialist move of first order magnitude. Have we just reverted back to Enlightenment fascism? There's only one history and we own it? Usually by the time someone says something like this, the right side of history has already been determined. 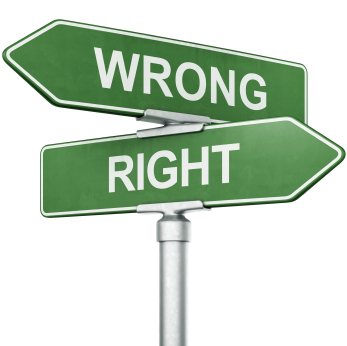 And, using this argument, I am being asked to make a decision between being on the right side and wrong side. The discussion is over. The whole discussion on being on the right side of history is a discussion ender. Who the hell wants to be on the wrong side of history? It's another instance of Godwin’s law, that law that says when you bring up Hitler, all discussion ends. By the way, if there ever was a good example of the claim to be on the right side of history, it was the Third Reich and all the German churchmen that joined in with that believing this was God at work in history. The churches that used Scripture and church tradition to support slavery and patriarchy were the churches most aligned with power, money and the State. They were the ones in power in the churches who had the most to lose if indeed slavery ended and women were given full entry into the power structures of society. In fact, go to the origins of the church's collusion with slavery and patriarchy and you see this same dynamic (some of us call it Constantinianism). They, like government, held on to these oppressions for dear life and used Scripture to support them. As I see it, the church appears to be on the wrong side of history everytime it aligns itself with power, money and the State. We should not follow what the state, money and power do. We should resist and struggle seeking faithfulness until by God's sovereignty and power, the state, money and power become faithful too. In that order. ..."being on the right side of history" remains for me a dubious moral argument. I prefer a less ambitious more humble posture. David's post is very insightful and worth your time. Thanks for these insightful reflections. There is also the Christological confession that Jesus Christ is the judge of human history. Peoples, nations, and even civilizations have their own understandings of what ideas and values constitute the "right side of history," but their judgments are only provisional in light of the eschatological judgment of Christ. Moreover, Christians should ask whose history matters, that of a particular society or that of the church? What is on the "right side of history" in the American (or some other) story is not necessarily the same as what is on the "right side of history" in the enduring, transcultural story of the church. Thanks for your comments. Well said!